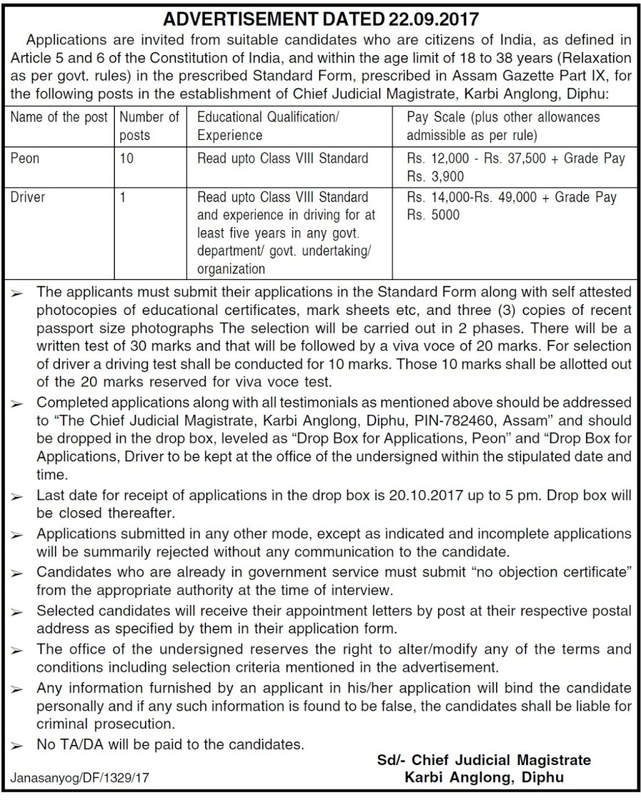 Chief Judicial Magistrate, Karbi Anglong, Diphu. Applications are invited from suitable candidates who are citizens of India, as defined in Article 5 and 6 of the Constitution of India, and within the age limit of 18 to 38 years (Relaxation as per govt. rules) in the prescribed Standard Form, prescribed in Assam Gazette Part IX, for the following posts in the establishment of Chief Judicial Magistrate, Karbi Anglong, Diphu. Educational Qualification: Read upto Class VIII Standard. Pay: Rs. 14,000-Rs. 49,000 + Grade Pay Rs. 5000. Educational Qualification: Read upto Class VIII Standard and experience in driving for at least five years in any govt. department/ govt. undertaking/ organization. Selection Process: The selection will be carried out in 2 phases. There will be a written test of 30 marks and that will be followed by a viva voce of 20 marks. For selection of driver a driving test shall be conducted for 10 marks. Those 10 marks shall be allotted out of the 20 marks reserved for viva voce test. How to apply: The applicants must submit their applications in the Standard Form along with self attested photocopies of educational certificates, mark sheets etc, and three (3) copies of recent passport size photographs. Completed applications along with all testimonials as mentioned above should be addressed to “The Chief Judicial Magistrate, Karbi Anglong, Diphu, PIN-782460, Assam” and should be dropped in the drop box, leveled as “Drop Box for Applications, Peon” and “Drop Box for Applications, Driver to be kept at the office of the Chief Judicial Magistrate, Karbi Anglong, Diphu within 20.10.2017 up to 5 pm.